Oriflame Current Catalogue is beautiful. If you want to join Oriflame in this month, you are welcome. For buying products from Oriflame May Catalogue you just need make list of the products you required. You can send that list along with your Full Name , Address & mobile no. to my Email id or Mobile. Join Oriflame in May Month place ur first order worth Rs 2200 and get the Essential Black Collection Wallet Worth Rs.790 for Free.Plus Welcome Program Gift worth Rs.3000. 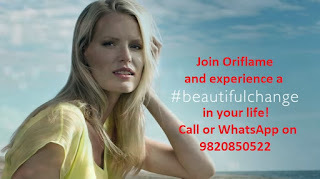 Join Oriflame E-Group, Get updates, Share ideas, Ask Questions, Learn & Grow!